These are flat flaky, palm-shaped little bites that can be made ahead of time and frozen. Even if the pastry is ready-rolled make sure you roll it out a bit thinner. Make the filling; Heat the oil in medium frying pan; cook garlic and bacon, stirring, until bacon is crisp. Add onion and pesto, stirring for 2 minutes. Stir in basil and cheese into bacon mixture and allow to cool, this could be down the night before. Lay the pastry on the work surface and roll out to very thin rectangle. Cut the pastry down the middle lengthways and spread half the filling on each piece of pastry; fold two opposite sides of the pastry inward to meet in the middle; press gently to flatten slightly. Roll each side in half again to meet in the middle: press gently to flatten. Wrap in cling film and put into the freezer for about 1 hour. # Preheat the oven to very hot about 220C (400F) mark 7. Lightly oil two baking trays. Cut the pastry rolls into 1.5cm slices using a sharp knife. Place the slices flat on prepared trays about 1.5cm apart. Bake, uncovered, in a very hot oven for about 12 minutes or until the pastries are browned lightly. To freeze ahead; complete the recipe and store the cooked pastry rolls in an airtight container. Freeze for up to 3 months.To use; Defrost the pastry rolls at room temperature for 1 hour, and warm through on a baking sheet in the oven at 180C (350F) mark 4 for 5 minutes. 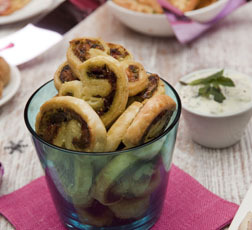 New potatoes make the perfect base for any number of delectable savoury nibbles. Here are three great topping ideas but use up any leftover ready cooked potatoes that you have. Each filling recipe makes enough for 24 tiny new potatoes. They can be made ahead of time and cooked from frozen. Look after yourself and those you care about by getting the healthy serving size right. If you've got a glut of cooking apples, cut them into quarters, core and peel them. To prevent apples turning brown whilst you are peeling them, squeeze the juice of half a lemon into a bowl of water and drop the pieces of apple into it. Drain, quickly pack the apples in freezer bags or plastic containers and freeze them. To use, put the frozen fruit in a pan with some sugar, add a very small amount of water and cook as normal.